GVF and its partners held the 8th annual Philabundance food drive, raising an incredible 3,000 lbs. of food. 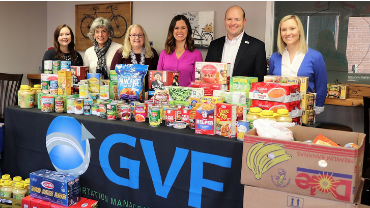 GVF, its partners RK&K, McMahon Associates, Suburban Transnet, and the Sheraton Valley Forge Hotel held their 8th annual holiday Philabundance food drive. The group raised an outstanding 3,000 lbs. of food. A 400% increase in donations compared to 2017. Philabundance is a non-profit that provides nearly 90,000 people in the region with food each week, in an effort to end hunger across Pennsylvania and New Jersey communities. GVF, a not-for-profit organization that partners with public and private entities. GVF’s mission is to achieve a desirable quality of life and a healthy, competitive economic environment by developing multi-faceted transportation strategies. “As important as it is for people to have access to reliable transportation, it is imperative that people have better access to food. Through the efforts of Philabundance in helping to end hunger throughout our region, we are thankful to have our partners collaborating with us on this important program. We are stronger when we are working together, thank you RK&K, McMahon Associates, Suburban TransNet and the Sheraton Valley Forge Hotel, for partnering with us on such an important cause,” said Rob Henry, Executive Director, GVF. Founded in 1990, GVF is a not-for-profit organization created to advocate and promote a viable transportation network for the region’s economic vitality. To maximize awareness and develop sustainable support, we partner with public and private entities.